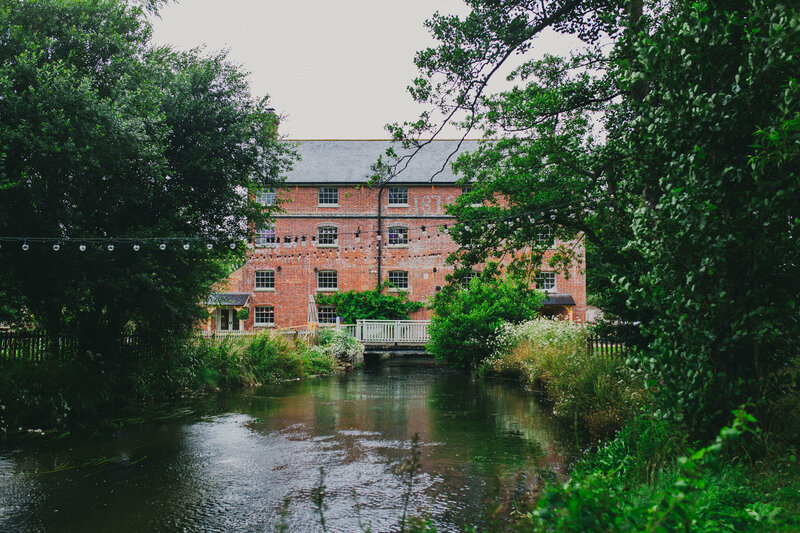 Sopley Mill is set on a 1000 sqm island surrounded by the Avon River. The lawn has stunning views across the wild flower water-meadows and is securely fenced from the river. You have plenty of space to bring in any extras you may want. From garden games to bouncy castles, summer fete’s and coconut shys, to marquees and Bell tents – the options are endless. We have uplit the trees and added stunning lighting to the Mill and the river so that in the evening your guests get a whole new look to the venue. As the sun sets over the garden, 200 metres of twinkly lights come on to make the garden come alive. For winter events, these outside lights come on earlier and give the Mill a truly magical glow. We have recently enlarged the terrace so if you do have a lovely winter day you can get 100 people on the terrace for drinks without girls having to stand with heels on the grass. The ground floor is made up of three individual and quirky rooms which feed into each other. In the Holt you have the viewing window of the old water wheel from where you can see the river rushing under the Mill. It also contains all the old equipment and grinding wheels of the old Mill – giving character which is hard to find in other venues. The Holt has its own bar which can be used for your drinks or Tom’s Bespoke Bartending Co. can run a Pay Bar there at any stage during your event. The next room contains the ground floor fireplace which is a wonderful place for drinks receptions. This space is also particularly good in the evening for older guests who want a cosy spot to sit and chat. The bright and airy Boat room at the end has large double doors heading into the garden. This is the ideal spot for an evening buffet on hot summers evenings when your guests are sitting outside watching the sun set. The Avon Suite is normally used as the Brides Room when a wedding is taking place at the Mill, but this room can be used (or not used) in whatever way you chose. The Granary is perfect for drinks receptions, as a meeting or conference room or for parties of up to 120 people. We have created this room to be purposefully light, white and bright. It has wonderful views from all sides of the stunning water meadows and river. Being south facing the sun streams through the windows and lights up the room without having to use artificial lighting. Even on wintery days the lighting in the Granary is designed to make sure you forget the weather outside and focus on having a good a celebration inside. The Granary contains a background music system, which is Bluetooth controlled, should you require any music. There is a full sized bar in the Granary, and again Tom’s Bespoke Bartending Co. can run a Pay Bar from here should you want it. The Granary room also becomes your dance floor in the evening. If you are planning evening music and would like to use a DJ we would ask you to use We Perform who provide the DJs for the Mill, this is to ensure we comply with NFDC sound regulations. We welcome bands at the Mill, subject to certain sound restrictions, and they would also play in the Granary (please ask us for full details). The Granary is also equipped with air conditioning – very important on hot summer’s evenings. The Riverview Room, on the top floor of the Mill, is the ideal place for dining. The vaulted ceiling and stunning beams are perfect for decorating with twinkly lights, flower garlands or bunting. You can decorate the Mill how you wish, but the wonderful character of the original exposed brick work means that you don’t have to over decorate to compensate for plain blank walls. All sides of the Riverview Room have stunning views over the water meadows from windows which are at the perfect height for seated guests. In the evening the sun sets over the meadows and floods in from the end window of this beautiful room. We have exposed the original wooden floor which even has the old grain hatchets where the corn was poured down into the grinding wheels below. It is these features that gives the Mill the history and character which makes it such a unique venue for your event. With its own catering kitchen, the Riverview Room can be laid out by your caterers during the day, without disturbing your guests. Once you have eaten and moved downstairs to the Granary room, your caterers can clear away without your guests noticing. It has always been important to us that the building flows well. Unlike many hotels, at no stage are your guests pushed out of rooms and not allowed back in. And, unlike marquees, you will never have to stand and watch caterers cleaning tables off dance floors before you can start you evening. The River View Room can fit 10 round tables of ten people per table or 9 round tables and 1 long table if you would like a long top table.